Entertainment Vancouver: "Simon Webb, Luc Roderique and Renée Bucciarelli bring out all the wit and clever banter that is the best of Shaw...delicious fun...you are transported to another age...Humorous, insightful and great theatre." Full review here. Audiences entered the Edwardian drawing room--and boxing ring--of George Bernard Shaw's How He Lied to Her Husband, brought sumptuously to life at exquisite Galbraith Manor. In this gem of a bedroom farce, when the gloves come off He, She, and Her Husband hilariously duke it out. 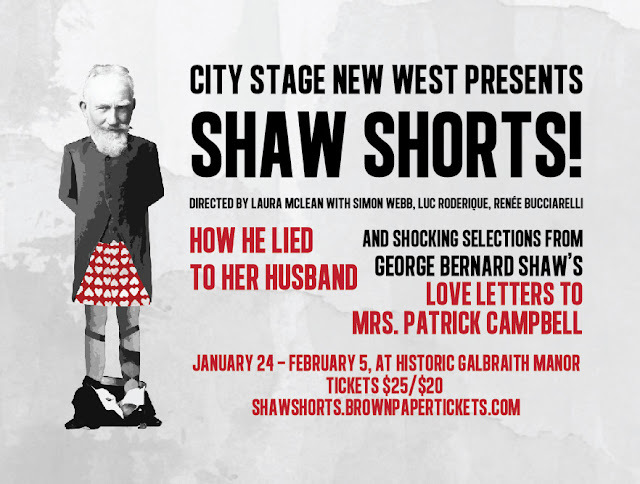 The Shavian farce parodies some of Shaw's own real-life shenanigans, as Love Letters to Mrs. Patrick Campbell amply reveals. George Bernard Shaw, the only Nobel Prize laureate to also win an Academy Award, was a literary giant of astonishing range whose "rare sense and inspired nonsense" shocked and delighted Victorian sensibilities. A devoted partner in a sexless marriage, he famously carried on an entertainingly passionate, creative, and conflicted love-affair-by-letters with Mrs. Patrick Campbell--one of the greatest theatrical stars of her time. Selections from 40 years of correspondence tease and tantalize: did they, or didn't they? 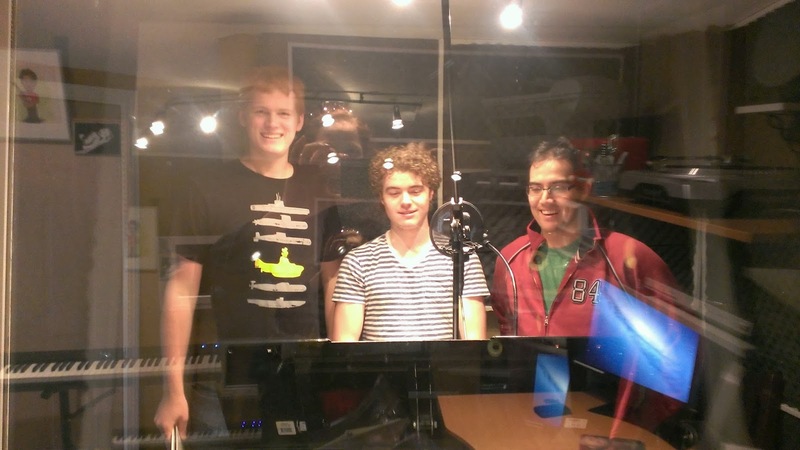 Click here to hear CiTR radio interview about SHAW SHORTS! Click here to read the Royal City Record article. This production was supported by a grant from the City of New Westminster. 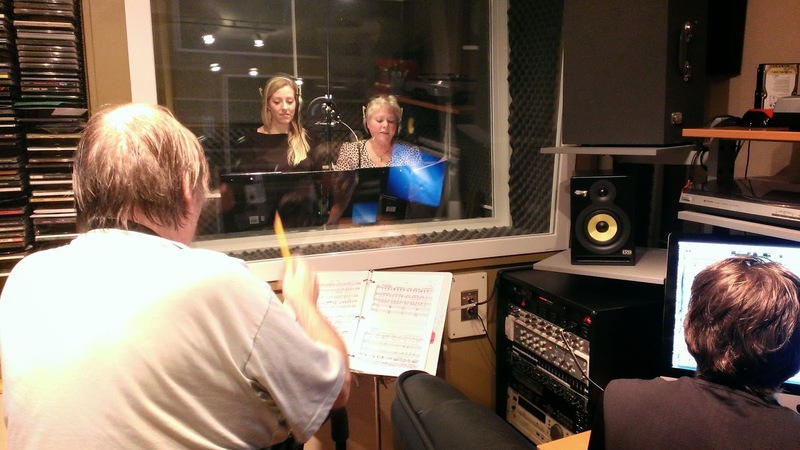 The original cast recording of STUMP CITY STORIES is completed! Here's a preview of the CD jacket, designed by Kaitlyn Hunter. For a preview of all related CD artwork, visit our Kickstarter page and check out the Updates on the top menu bar, or click here. 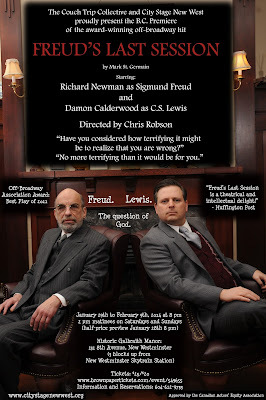 For a list of all composer George Ryan's lyrics from the show, click here. Thanks again to all the wonderful supporters (listed in an entry below), talent, and worker-bees on this project. Stay tuned for more updates as we work toward formalizing our gift to the City of New Westminster. 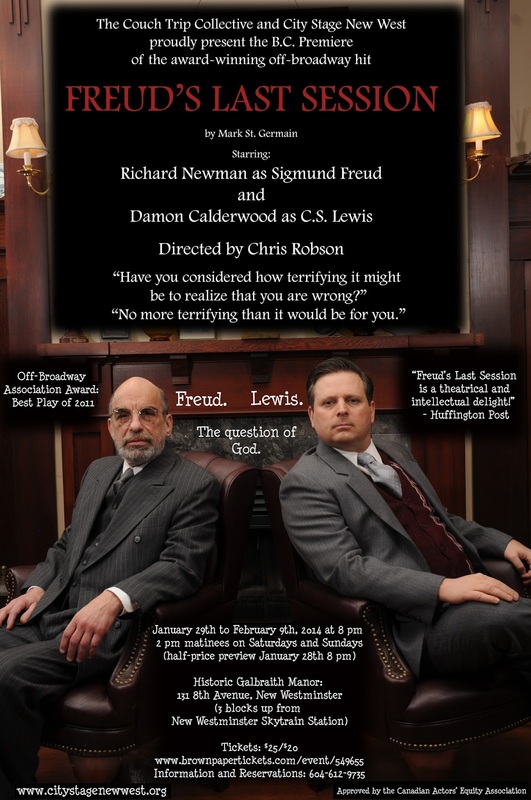 City Stage New West was proud to support FREUD'S LAST SESSION in January 2014. Click here for glowing Review Vancouver article. 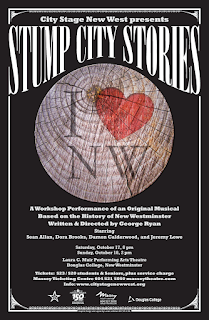 We're making a professional cast recording of STUMP CITY STORIES—the Ovation-nominated musical based on the history of New Westminster, by award-winning composer George Ryan. Visit KICKSTARTER to find out more about this superbly entertaining and educational project that will continue to benefit and bring joy to so many. Cast rehearsing "On the Frozen Fraser" in 2010 (Damon Calderwood, Sean Allan, Jeremy Lowe, Dora Brooks). City Stage New West photo. 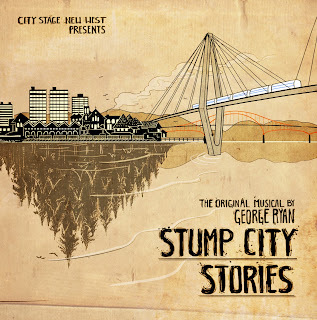 With Kickstarter we raised $3,000 of the approximately $15,000 needed to produce a professional cast recording CD of STUMP CITY STORIES. We've also received generous grants from the City of New Westminster, a BC Multicultural Grant, and some awesome private donations (thank you "Chung Koh" Project Partners Dennis and Christine Magrega, and "Jim Walker" Partners Peter Julian MP, Chuck Puchmayr, Holy Trinity Cathedral, Accurate Lock Safe & Alarm Co., 5th Avenue Therapeutic Massage & Acupuncture Clinic, G & F Financial Group, Team Dave Vallee, Adam Goldberg, Patricia Curtis, Henry Chen, Raymond Burr Performing Arts Society), Anonymous, and approximately 70 individual donors from British Columbia and other Pacific North West locations, as well as from places as far away as New York, Hong Kong, and Alabama! Chorus members Scott Grimsey and Gower Roberts with principal Jeremy Lowe, in the recording studio at Mix Media. STUMP CITY STORIES' 18 songs tell the history of New Westminster and British Columbia in humorous, poignant, toe-tapping style, from the Quayquayt First Nations and the arrival of the British through more recent times--celebrating British Columbia’s original Chinatown (Yi Fao) and diverse populations, the dramas of the Great Freeze, the Great Fire, the Great Bank Robbery, the controversial moving of the Capitol, the blissful nostalgia of the Interurban Line, CKNW radio’s success, and the advent of more recent heroes including film-and-tv star Raymond Burr, astronaut Robert Thirsk, and professional athletes Justin Morneau and Billy Ranford. 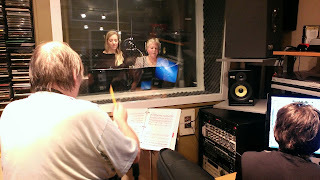 George Ryan conducts chorus members Jackie Block and Karen Crew, with sound engineer Steve Bulat of Mix Media. 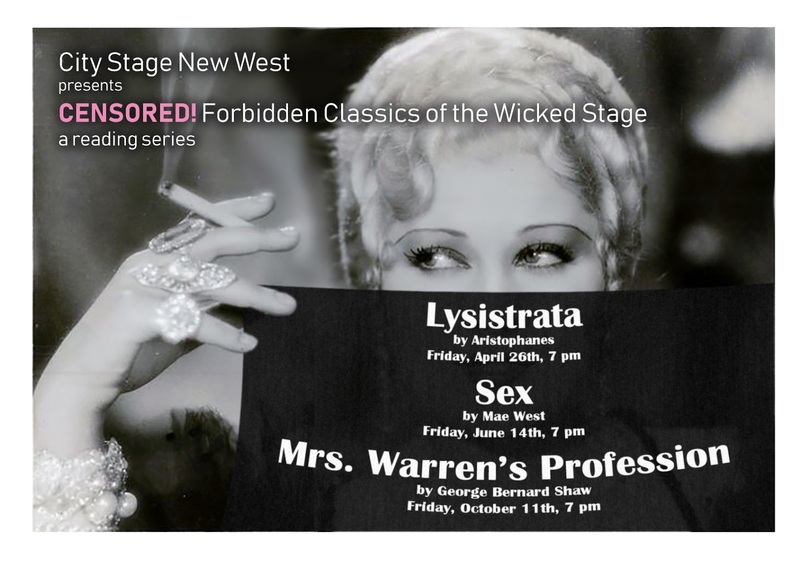 This is the third leg of City Stage New West’s ongoing cultural legacy project: to produce a lasting record of this superbly entertaining and informative musical. 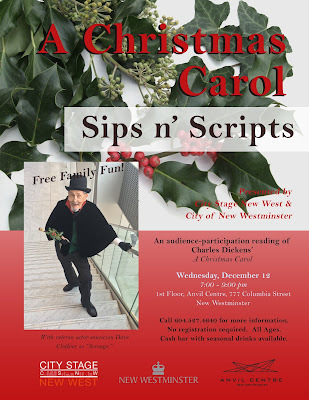 (Commissioned by City Stage in 2009, the musical was brought to 1500 New Westminster Secondary Students free of charge in 2010.) Once done, the CD will be donated for use to the City of New Westminster, the Fraser River Centre, the Museum and Archives, the Anvil Arts Centre, Library, and School District for future civic events or educational purposes. 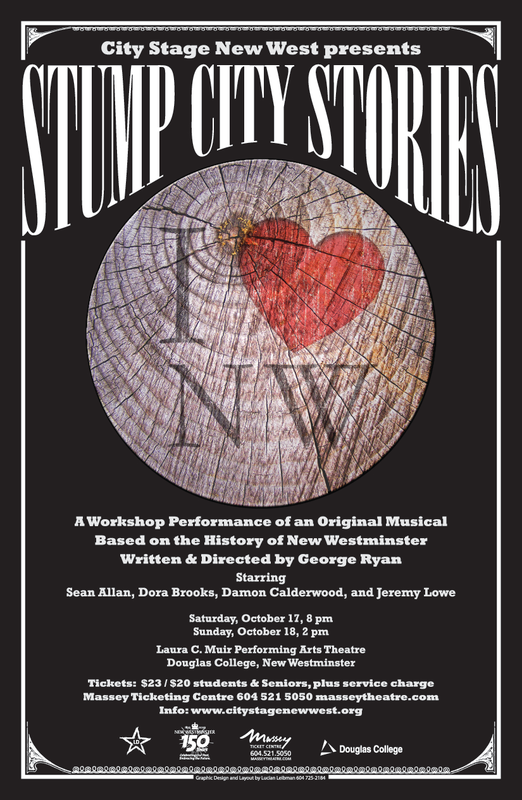 Many of the songs from this musical are paeans to our City and British Columbia, perfect for use at civic events and in educational settings. Kickstarter made a splash in the news this August when it was first launched in Canada. It is a unique online crowd-source fundraising platform for creative projects only, and has a very successful international track record. Our campaign was the first Kickstarter project in New Westminster, and is featured in an article in Douglas College's paper, The Other.